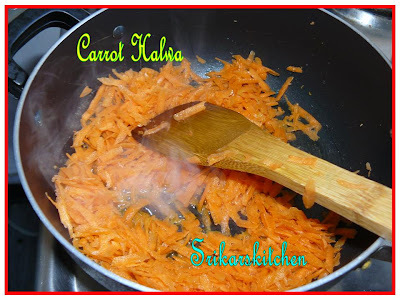 Heat butter in a pan, add grated carrot & cook for few min. Add milk & cook until almost done & add sugar, cardamam powder. Add the almond powder & cashew nuts & mix through thoroughly & do not stop mixing as it will stick to the pan.stir in well until it is soft & fluffy & most importantly it will come to a stage of not sticking to the pan. WOW... This is my fav. Looks so good. 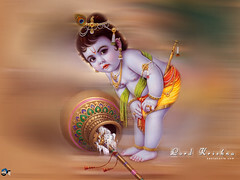 Nice pics.... 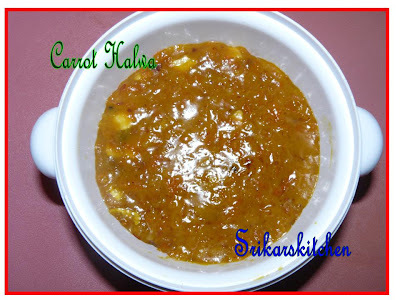 I have also posted my version of carrot halwa long back. this looks fabulous and rich..i love it. nice picture..looks yumm too..I make it a bit different..you can see my version in my blog if you find time..
looks great.. different recipe than how I make.. I'm sure almond powder will give it a good twist! 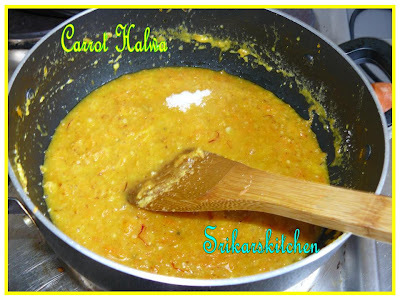 Looks rich and very very tasty..
carrot halwa reminds me of winter in delhi... looks delicious. Is this dish Indian. It sounds very interesting as I have never seen a carrot halwa before.